A recent Eleventh Circuit decision sheds new light on the battle between First Amendment and collegiate trademark rights. It may even provide more guidance for unlicensed trading cards. Starting in 1979, Daniel Moore painted famous football scenes involving the University of Alabama. Moore was an alumni of the school. 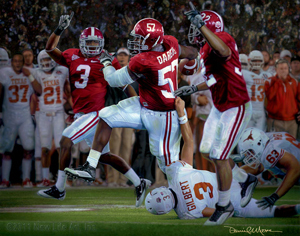 The paintings featured realistic portrayals of Alabama's uniforms, including helmets and jerseys, and crimson and white colors. Not only did he do paintings and prints, his art also appeared on calendars, mugs and other items. Although Moore had a license from Alabama for some of his paintings, his battle began in 2002 when the university informed him that he needed permission for all of his works that depict its uniforms (because the uniforms are Bama trademarks, and have Bama trademarks on them). Moore countered that he did not need permission because the uniforms were being used to realistically portray historical events. You can probably guess what happened next. Alabama sued Moore for breach of contract, trademark infringement, and unfair competition. This all happened in 2005 -- seven years ago. Legal side note: Justice in this case was not swift. It was filed in March, 2005, and only now is there an order from the court of appeals. After seven years of fighting, however, the case is not over. The court of appeals ultimately sent the case back to the district court for additional proceedings. As the court of appeals commented, "The case took a meandering path through the district court, having been assigned at various points of the litigation to seven different district court judges." Yes, that's one district court judge per year. And no, each Alabama judge did not want their own Alabama autograph. But as soon as they got one, they passed the case on to another judge. Now, only the trademark cause of action is of interest to the trading card industry, so we'll just ignore the boring contract and unfair competition claims. Legal translation: Contract claims are always boring. On appeal, the Eleventh Circuit's analysis carved the case into two parts: 1) paintings, prints and calendars and 2) the "mundane products" like mugs. For paintings, prints and calendars, the issue was: did Moore's First Amendment rights to paint famous Alabama moments trump Alabama's trademark rights? The depiction of the University's uniforms in the content of these items is artistically relevant to the expressive underlying works because the uniforms' colors and designs are needed for a realistic portrayal of famous scenes from Alabama football history. Also there is no evidence that Moore ever marketed an unlicensed item as “endorsed” or “sponsored” by the University, or otherwise explicitly stated that such items were affiliated with the University. Moore's paintings, prints, and calendars very clearly are embodiments of artistic expression, and are entitled to full First Amendment protection. The extent of his use of the University's trademarks is their mere inclusion (their necessary inclusion) in the body of the image which Moore creates to memorialize and enhance a particular play or event in the University's football history. Even if some members of the public would draw the incorrect inference that had some involvement with ... that risk of misunderstanding, not engendered by any overt [or in this case even implicit] claim ... is so outweighed by the interest in artistic expression as to preclude” any violation of the Lanham Act. (internal citations omitted). Legal translation: No one should be able to control historic events, or keep them out of the public domain unless the work has a great chance of confusing consumers about the source of the goods. Here, since few consumers would be confused as to whether Alabama authorized or created the paintings (heck, they have Moore's signature on them), the First Amendment wins. It is important to note that the facts showed Moore's paintings only used Alabama's trademarks in the paintings themselves (not on the back, or frame, etc.) and that may have helped in the court's analysis. So, Moore won the first part of the case. He was not so lucky with the the "mundane products" part. Not because these items are not protected by fair use or the First Amendment, but because Moore did not make the same arguments that he did for paintings, prints and calendars. Because he forgot to make those arguments on appeal, the Eleventh Circuit considered them waived. It's really too bad his appeal brief did not have a sentence that said something like, "Hey judges, you know all of those arguments that I made for paintings? Well, yeah, they apply to mugs and stuff, too." That would have been good enough to present the argument to the Eleventh Circuit, and maybe get him the win there, too. So, how does this affect the trading card industry? It's another arrow in the quiver for unlicensed trading cards. Although Alabama v. Moore dealt with trademark issues, it meshes nicely with the Aldrin v. Topps decision, which dealt with right of publicity issues. There, the district court found that Topps' use of Aldrin's name, image and likeness on its trading cards and packaging was protected speech because “the cards use[d] Aldrin's name in the course of conveying information about his historically significant achievements." So, now there are at least two cases finding that historical events can trump a variety of intellectual property rights. Legal warning: Before everyone goes crazy and starts manufacturing unlicensed cards in their basements, there are a few limitations that need to be pointed out. First, the Eleventh Circuit Court of Appeals has limited jurisdiction. Legal translation: The Eleventh Circuit covers Alabama, Georgia and Florida. Considering that swath includes a quite a few SEC powerhouses, it has a far reach, but does not cover the entire United States. There is arguably a broader reach in that the Eleventh Circuit cited two other circuit courts as support in its decision. These courts may come to a similar conclusion: "[W]e have no hesitation in joining our sister circuits by holding that we should construe the Lanham Act narrowly when deciding whether an artistically expressive work infringes a trademark." And when the Eleventh Circuit refers to "sister circuits," it means the Second Circuit (Connecticut, New York and Vermont) and Sixth Circuit (Kentucky, Michigan, Ohio and Tennessee). And although this covers a lot of territory, it's about 40 states shy of unanimity. And while the Aldrin v. Topps decision was a district court decision from the Central District of California, it settled before the Ninth Circuit Court of Appeals weighed in, so it gains you just a little more geography (really, just Los Angeles and the surrounding area). So, quite a patchwork is being created for non-licensed cards. But given that the trading card market covers the entire United States, all it takes is one differing jurisdiction to open up liability. Second, courts are limiting the times when the First Amendment trumps intellectual property rights to famous or historical events. Moore's paintings depicted famous Alabama moments. And while famous Alabama wins are less momentous than the moon landing, it does move the sliding scale of what is historical down considerably (although I'm sure some Bama fans would argue that games such as the 2008 Beatdown in T-Town is more important than a moon landing. But outside of the state of Alabama, that opinion is likely a minority). Third, although we got clarification as to paintings, prints and calendars, we didn't get clarification for "mundane products" (due to how the case was presented and because Moore dropped his First Amendment arguments for these goods). This was really a missed opportunity because, arguably, trading cards could fall into the "mundane product" category. I think the court probably would have ruled in Moore's favor for "mundane products" had the issues been properly presented, but since it was not raised, we just won't know. So, does this case carve out exemptions for everyone to make their own unlicensed cards? Clearly not, but, it's one more case showing that the landscape may be moving toward allowing some type of unlicensed cards focused on famous events. An entertaining future battle will be – how famous does an event need to be to trump intellectual property rights? Does it just need to be historical? Because really, even batting in the low .200s is a piece of MLB history. Or does it need to be a highlight reel moment? Regardless of the future, this case is definitely not a win for Alabama, or for its SEC neighbors. And although Auburn normally cheers when anything goes wrong for Alabama, this is one loss that even they can’t happy for given that Auburn also is in the same state and under the same jurisdiction. Alabama Memorabilia-Daniel Moore " Rebirth In The Swamp" good condition.